Based on information and photographs provided by Jennifer Littlewood, a descendant of the Brooks family from Swanbourne. 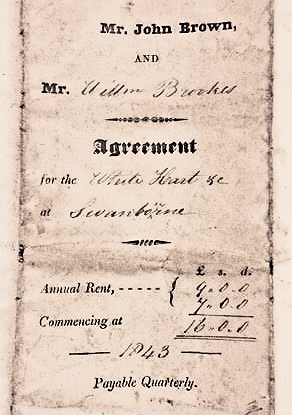 There is also a record of William Brooks at the White Hart in a trade directory of 1847. 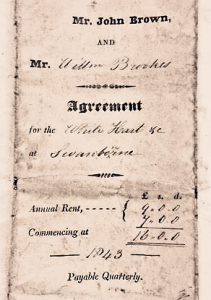 Another trade directory of 1853 has Mr Brooks as running the Swan Inn – and also a farmer. After leaving the Swan Public House, and left there to move into 17 Winslow Road, greatly extending the property. 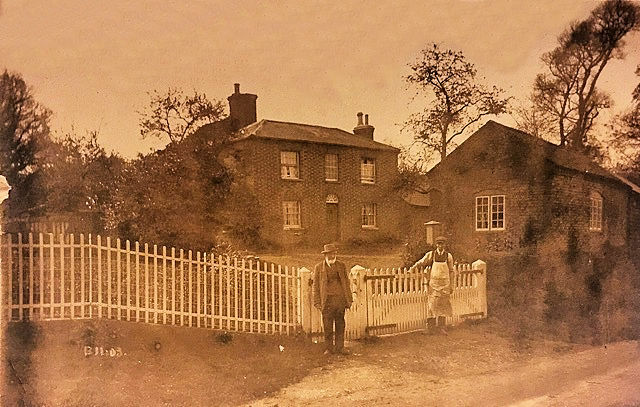 Photograph (right) 17 Winslow Road c 1910. From left to right : William Brooks ( my father’s grandfather) b 1848 d 1928; George Richard Brooks b. 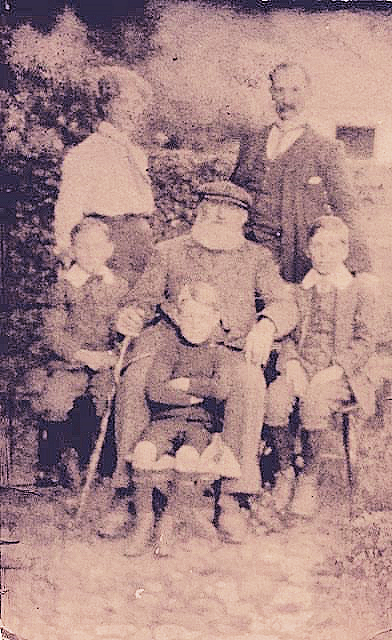 1899 ( my father’s father); Alice Brooks ( sister of George Richard Brooks ); Alice Lucy Mary Brooks ( wife of William ) b 1855 d 1915, nee Wood ( she was the daughter of John Wood and Harriet Keinch of London); Thomas Edlin Brooks ( brother of George Richard Brooks) – he is the man looking over the fence; Helena Edith Brooks ( sister of George Richard and know as Nellie). 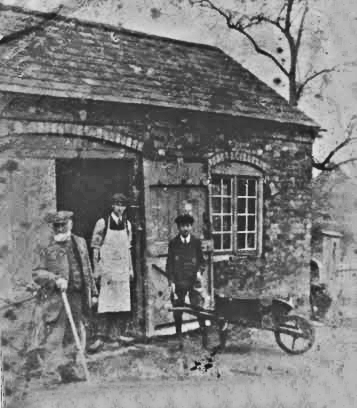 The photo shows the workshop before it was demolished more recently. It had begun to lean towards the road. The Georgian front to the house was built by the father of the William Brooks shown in this photo. He was also William Brooks and his dates were 1815 to 1888. Photograph (right) 17 Winslow Road c 1903. 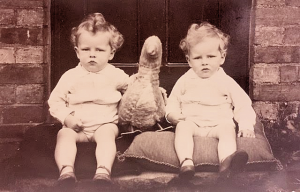 William Brooks (my father’s grandfather) and on his left, his brother Tom Brooks. I noticed on this photo compared with the photo above that it looks like false windows used to be painted to create the illusion of a fan above the door, and a middle upstairs window. Not of any historical interest, but caught my eye, compared with how the house looks now. Inside the house, it is very obvious (or was – the last time I was in it – that the back dates to a much earlier period than the front). Photograph (left) Family Group standing in front of the now demolished workshop ( which was also built by the Brooks family). From left to right. William Brooks (my father’s grandfather), Tom Brooks (my father’s uncle) and George Brooks (my father’s father). 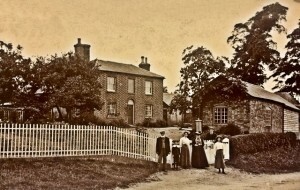 C. 1910. George William and Cecil James Brooks (known as Jim) with toy duck. Both born 3rd February, 1931. 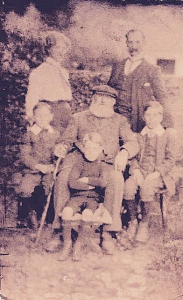 George is the eldest (on the right). Age c 18 months. Family Group. William Brooks (my father’s grandfather) is seated in the middle, but the rest of the group remains unidentified.